Britt Roberts (Games Freezer): For those who aren’t familiar with your work, can you give a brief overview of your time so far in the industry. Aaron Conners: I started out with Access Software back in 1991, where I wrote and co-designed the Tex Murphy games: Under a Killing Moon, The Pandora Directive and Overseer. Later on, I worked for Microsoft as a User Experience lead, Take-Two Interactive as a Story Director, Ubisoft Montreal and Big Finish Games as a Creative Director, and then Electronic Arts as a Senior Designer. In all, I’ve worked on 30+ games and published four books—three novels and one non-fiction. BR: Can you give some insight into how you became involved with the Tex Murphy series? I know that after Martian Memorandum they were keen for more heavyweight writing and turned to you but I was intrigued as to how you came on the scene. AC: I owe it all to a friend back in high school. We were in a really tedious Chemistry class and I spent most of the semester writing an epic poem about the fantastic adventures of our boring teacher. My friend thought it was amazing and, ten years later—after he joined Access Software as a programmer and found out they were looking for a creative writer—he tracked me down and invited me to come to meet Chris Jones, the creator of the Tex Murphy series. Chris and I hit it off and, just like that, I was in the video game business. I should add that I’ve always been obsessed with games—I grew up making dozens of board games of all different types—and I had a short story published in college, so I wasn’t completely unqualified. 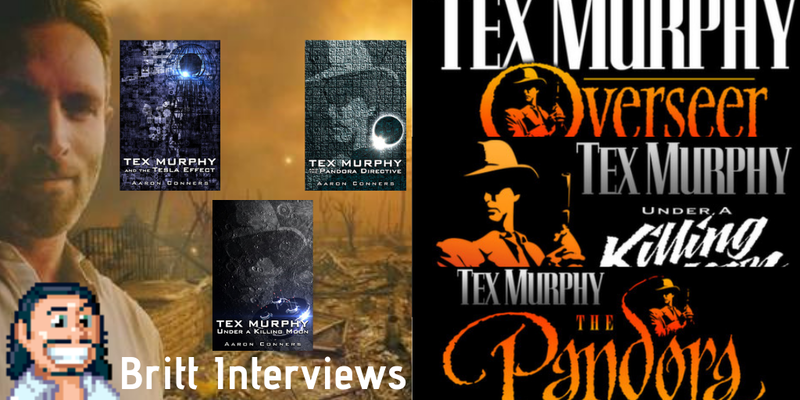 BR: I recently read your novel The Pandora Directive, based on the game of the same name and wondered if you approached the Tex Murphy universe slightly differently in novel form as there was less of a focus on slapstick. I was wondering if this was because the more visual gags didn’t really translate to the written page or if Chris Jones and the crew were responsible for the more over-the-top comedy segments? AC: Actually, I wrote the Pandora novel before the game was developed, so the tone of the book reflects my personal tastes. So, yes, I’d say I’m a little less “slapsticky”. And you’re right about what makes the visual medium enjoyable is often very different from what works with the written word. BR: I watched The Making of Tex Murphy on YouTube for the first time and was touched by the ‘we’re all in this together’ vibe. I was also struck by how many people involved in the production side got in front of the camera, do you feel that gang sensibility has waned in the industry or do you still think it’s out there…just with less baggy clothing than in the ’90s? AC: Ah…the baggy '90s clothing. Gone, but not forgotten. Chris and I always felt incredibly lucky to be making adventure games for a living and had a great time doing it. I think our enthusiasm came across, both in the feel of the games and in the production process. And Chris (who was Access Software’s CFO) is a notorious cheapskate, which is why so many of us played roles in the games—he was already paying everyone to do other jobs! He always said he played Tex because he was the cheapest actor he could find. As for how it is now, it just feels more “corporate”, at least in my personal experience. Back then, we were just a tiny company winging it. BR: What do you think gives Tex Murphy its longevity with the fans? For me, there’s a sort of timeless, relatable warmth that comes from the writing and characters. Also, there’s no punching downwards in the gags which adds to the charm. I'm interested to know your take on it. AC: I think most good story experiences come more from strong characters than a great plot, though of course, you’d like both. You want players/readers to care about the characters and be emotionally invested in their interactions. Fortunately, our characters endeared themselves to our fans. And I believe a big part of the charm is that Chris and I have never taken ourselves—or the games—too seriously. We just wanted to make games that we’d like to play and write books we’d like to read. BR: Is there a certain moment in the games or books that you feel sums up Tex Murphy or maybe your feelings towards the entire shebang? AC: That’s a tough question! There are so many moments I enjoy, but one that sums up the Tex Murphy experience? I guess, if I had to choose just one, it would be the “Chelsee” ending in Pandora, where Tex finally gets an evening with the woman of his dreams. There were a number of ways that game story could end and the Chelsee ending was the hardest to get. It’s romantic, warm and funny with a twist that really captures the humour of the series. If you haven’t seen it, just google “Chelsee Ending Pandora Directive”. BR: I can see that The Poisoned Pawn (The 7th game in the Tex Murphy series) is well underway and I was wondering if there would be an accompanying novel or perhaps a standalone story? As much as I enjoy the games I have to admit the novels are becoming an addiction! AC: Yes! In fact, I’ve finished the first draft of the Poisoned Pawn novel. The plan is to release the book in conjunction with a corresponding game, which is currently in production. We don’t have a release date yet—it’s a year or so out—but I’ll have updates on my website (www.aaronconners.net). I’m also writing another Tex Murphy novel, which takes place after the Pandora Directive story and includes the events from Tex Murphy Radio Theater. This book, tentatively titled “Tex Murphy and the Romanov Enigma” will be the only book in the series not tied to a game. Again, all the details are on my website. BR: There was a point in the ‘Making Of’ documentary where Chris Jones lamented the lack of quality of similar FMV-based games of the era (mid-late 90’s) which led to a loss of faith in them from consumers. Recently, companies like Wales Interactive have made strides in making games such as The Shape-shifting Detective, Late Shift and The Bunker, do you feel the medium was short-changed by low-quality games being released and effectively casting a shadow on the market? AC: Definitely. There were so many mediocre FMV games back then, it became a joke. It’s great to see the new games doing FMV the right way. BR: You’ve been involved in a lot of different things over the years. Moving away from Tex Murphy, are there other titles that you were involved in that stand out in your mind? AC: Other than the Tex Murphy series, my favourite game to work on (believe it or not) was a snowboarding game, Amped 3. As the Story Director, I was tasked with creating a story that would appeal to kids, gamers and snowboarders (who don’t think anything is cool), while not get in the way of the gameplay. It was pretty much impossible, so I just went crazy and came up with the most ridiculous stuff I could think of. Gamespot actually nominated it for Best Story and it won the award for Most Outrageous Game. BR: What games, movies or books have grabbed you recently or were an influence? AC: It’s been a while since I really loved a movie, but I adore The Incredibles I & II (anything by Brad Bird, really). Other favourite movies are mostly film noir (Hitchcock, Maltese Falcon, Out of the Past), but I do love a good rom-com. I think it’s the toughest genre to do really well. My all-time favourite is Casablanca. I’ve watched it a hundred times. Books/author influences include Sherlock Holmes, The Hardy Boys, Kurt Vonnegut, Stephen King, Lee Child. As for games, I was a big fan of the Telltale games and anything by Tim Schafer. BR: I can see from your website that you are currently working on three more novels to complete the Tex Murphy story, as you have been writing the character for so long, has there always been an endpoint in your mind or are you going to see where the novels take you (and us)? AC: I’ve known where Tex would end up for a long time, though I’m not exactly sure how he’ll get there. He and the other characters sometimes take me in unexpected directions. BR: Thank you so much for doing this personally, I’m really enjoying my time with your work and look forward to what comes next. Cheers! AC: My pleasure! I’d just like to thank the Tex Murphy fans, who’ve been so loyal and supportive of our games and my books for all these years. I hope they’ll enjoy the upcoming books and games as much I enjoy working on them. "I’d also like to point out that during my extensive research I found that Chris Jones looks like an older brother of Matthew McConaughey and that Adrian Carr, director of The Pandora Directive, Overseer and The Tesla Effect really reminded me of Ringo Starr."